Some ideas take a bit more time in the oven, that's just how it is. It can feel frustrating, and like we're treading water when we can't get enough of a solid grasp of an idea in order to get stuck in. But sometimes, if we try to solve some problems or force ideas by prodding them too much, we might end up teasing them to death. Sometimes it’s worthwhile to trust that they will ripen once the time is right. Have you noticed how often new ideas or solutions pop up when you finally give yourself time to relax? When you lie in the bath, or sit in a beach chair listening to the waves, suddenly a solution to an old dilemma or a clear strategy to a niggling new idea will just present itself, and you’ll have to make a mad dash out of the bath or through a crowded beach, to get to a pen and paper so you can write it down before it moves on. 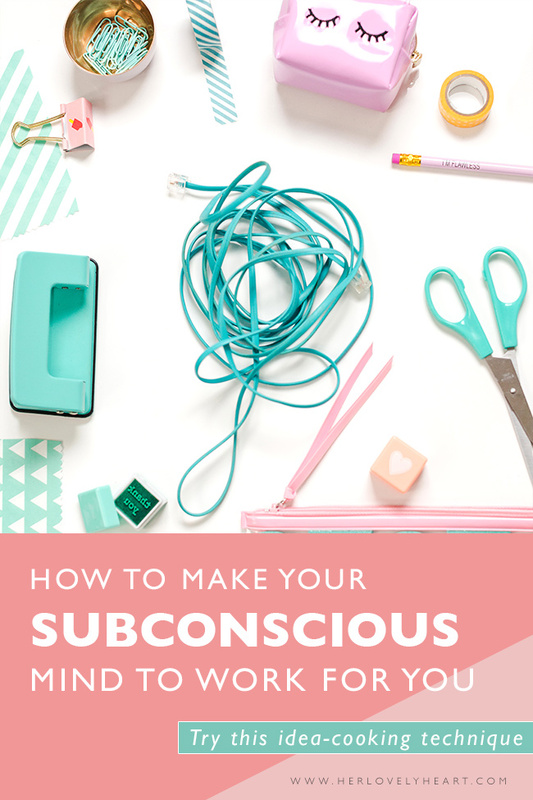 Our subconscious is constantly at work. Even when we sleep it’s at work figuring stuff out. Depending on how much information you are throwing at your brain each day, it will have less or more capacity to work on some of those background problems. Many scientists, authors and other creators intentionally use and trust in this subconscious process. Philosopher Bertrand Russell famously wrote in The Conquest of Happiness about his deliberate subconscious process. When he needed to write about a difficult topic, he would think on it intently for a few hours or days, and then dispatch it to the unconscious mind with the orders to work on it ‘underground’. When he’d return to the topic consciously in a couple of months, he’d find that the work had been done and he was able to proceed. Now, that's a pretty cool concept if you ask me! Trusting that your unconscious is working for you will cut down on the time you spend worrying about not making any progress, which is something a lot of us are guilty of. All that time spent worrying is time wasted, when you might as well carry on with other things and trust that your subconscious will provide you with solutions to your dilemma in due course. Sometimes your mind is just waiting for a piece of information you haven’t consumed yet, or a spark of inspiration that might come from an unusual source later on. So, try removing the deadline from your problems, and trust that a process of incubation will help you cook them to fruition when the time is right. If you want to try to work your subconscious mind more intentionally like Russell, here's how you can begin the process. Try to imagine how solving your problem would change the world or your immediate circumstances. Visualise a world where you have come up with a solution to your dilemma. Read and collect all the information you come across that could help you with your challenge. Ask questions, research other fields. Consciously work on the problem until you feel like you have prepared as well as you can. Tell your brain to work out the solution while you concentrate on something else. It might feel silly, but it will make a difference. You can even say it out loud, making sure your subconscious knows what you’re after. Forget about the whole thing for a while. Depending on the magnitude of your problem, it could be a few days or a few months, in some case even years, until you hear back. Don’t beat yourself up about not making any progress, but rather concentrate on working on other areas. Plus, remember to let your conscious mind rest once in a while, go for a walk, watch a movie or sleep on it. It may take hours, weeks, days, or months, but once your solution presents itself it will feel so obvious. Make sure you’re always ready to catch these solutions your subconscious is throwing back at you, they might come when you least expect them! Allowing your mind time to cook your ideas and solutions until they are ready can feel hard in today’s fast paced world. But being prepared to send some stuff to the ‘back room’ to be worked on while you take care of other business is actually a lot better use of your time than banging your head against the wall trying to force a story or a solution out when it’s simply not fully formed yet. « Turn reading into a real-life superpower!